Not only a great tool, but very fast response from the developer. Good job! Add a title to the text button. NOTE: New options added to block form in version 2.2. Float image button block left, right or center. Float text button block left, right or center. Choose text button background, border and text colours. Please read the documentation if you have issues with text button after upgrading. 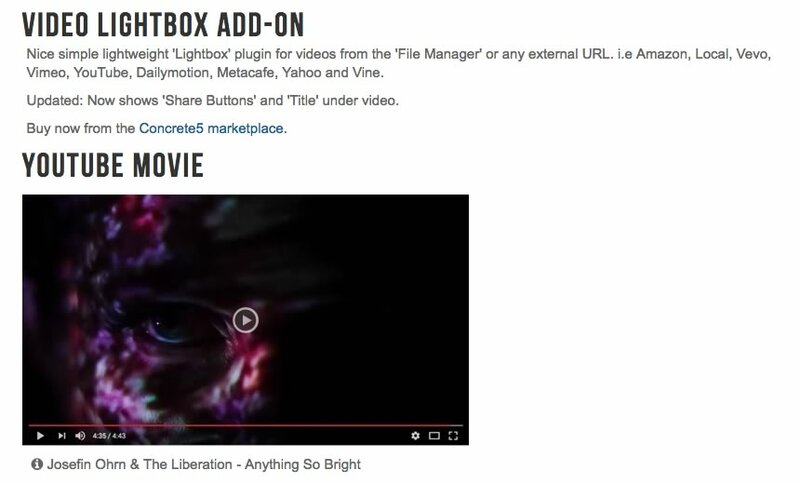 Nice simple lightweight 'Lightbox' plugin for videos from the 'File Manager' or any external URL. i.e Amazon, Local, Vevo, Vimeo, YouTube, Dailymotion, Metacafe and Yahoo. Shows border, video title and share buttons in popup lightbox, see screenshots. Remove social icons showing under lightbox (Feature request). Use a background image or text button to launch video, see screenshots. Choose an MP4 from the 'File Manager' or paste in an external URL. Add as many videos as you want. Make a gallery using the layout tool. Lazyload script included. Alows videos in large galleries to show only when in viewport. Good for page speed and mobile devices. Any embed video links you get you MUST only use the URL, as shown below.